KET and PET are examinations administered by University of Cambridge ESOL Examinations (Cambridge ESOL), which is a part of the University of Cambridge Local Examinations Syndicate (UCLES). Cambridge ESOL offers an extensive range of examinations, certificates and diplomas for learners and teachers of English. They are suitable for learners of all nationalities, whatever their first language and cultural background, and there are examinations suitable for learners of almost any age. The UCLES (Cambridge ESOL) offers many examinations among which KET (Key English test) and PET (Preliminary English Test) are the two basic tests that examine a person's proficiency in English. KET is an early learning program, which certifies that the candidate has acquired a general basic ability in English. It is equivalent to the Council of Europe's Waystage 1990 level, and it tests ability in reading, writing, listening and speaking (three papers). English language examination: PET assesses language ability at the Council of Europe's Threshold level, and certifies that the candidate should be able to cope linguistically in a range of everyday situations that require the use of English. PET tests ability in reading, writing, listening and speaking (three papers). KET (Key English Test) assesses the basic ability of candidates to use English in simple real life situations, both with native and non-native speakers, whereas PET (Preliminary English Test) assesses the language ability of a candidate to use English in most everyday situations with both native and non-native speakers at a pre-intermediate level. KET was developed between 1991 and 1994, during which time extensive trials took place. It offers a basic qualification in English and also represents a first step for those wishing to progress towards Cambridge Level Two, the Preliminary English Test(PET). It may be seen as either an objective move towards the Threshold Level, or as a final objective in itself, indicating that successful candidates have the linguistic ability to satisfy their most basic communication needs. KET is taken in over sixty different countries, with the majority of candidates in Europe, South America, and the Asia-Pacific region. The final mark a candidate receives in KET is an aggregate of the marks obtained in each of the three sections (reading/writing, listening and speaking). There is no minimum passing mark for individual papers. KET has two passing grades: Pass and Pass With Merit, and two failing grades: Narrow Fail and Fail. 'Pass' ordinarily corresponds to about 70% of the total marks. 'Pass with Merit' corresponds to approximately 85% of the total number. A 'Narrow Fail' grade means that the candidate is within 5% of the 'Pass' level. KET is usually available six times a year on fixed dates in March, May, June (twice), November and December. PET was introduced in the late 1970s and tests competence in Reading, Writing, Listening and Speaking, at a higher level than the KET exams. The language level of PET is approximately two thirds of the way towards that of the First Certificate in English. PET is based on the Council of Europe Threshold Level (1990) by van Ek and Trim. PET is taken in over eighty different countries, with the majority of candidates coming from Europe and South America. The final mark a candidate receives in PET is an aggregate of the marks obtained in each of the three sections and there is no minimum pass mark for individual papers. Like the KET exam PET also has two passing grades and two failing grades. The British council Teaching Center located in Dhanmondi provides all the necessary information for these two tests and is the official testing center. The registration for KET and PET cost 1950 taka and 2250 taka respectively. After the YLE (young learners examination) - which tests proficiency in English among children aged between 7 to 12 years, KET and PET tests can give the examinee a clear idea about how good he or she is in this international language. Yasser Rizvi, age 23, was one of the 12 participants of the national basketball team who went to India recently to play in the Middle Asia qualifying rounds of the Asian Basketball Championship. Now he is back from his tour and busy with work again and was able to give some of his valuable time for the following interview. aRmEeN(A): When did you first start playing basketball? Yasser Rizvi (YR): About 8 years ago, when my family and I were living in Zambia. YR: Well, it's quite the popular sport in Zambia, where I grew up. Although there was football, basketball interested me more. A: Tell us a bit more about your basketball background.YR: I played the game while I was in school in Zambia and then in England. Afterwards, I was the captain of the basketball team in my final year in University College of London. After I returned to Dhaka, I joined the First Division Club team Joesephites, for which I still play. A: How did you end up joining the national team? YR: There was a tournament between all the First Division teams in the month of May-June, in which I participated. During that competition, players were chosen from the various teams and asked to attend a training camp in Mirpur Stadium, which went on for about 3 weeks. Although, players from the defense sector of our country are given priority, as they are very fit physically, this time round, civil players were given a go-ahead too. After that, the final 12 were chosen, who were then trained further. A: What was the eventual team composition? YR: There were 4 players from the Navy, 2 from the Army, 1 from the BDR, 3 from BKSP and the last 2 were from the Josephites. A: What is a normal training session like? YR: We trained twice a day, early in the morning from 7am to 10 am. In this case, I was lucky as my office, Standard Chartered Bank, was very supportive, allowing me to practice in the morning and be late for work. There was another session, usually in the evening. We usually start off with a half-an-hour warm up followed by drills, ones where we were taught how to react to and play in different situations during the game. Then the team was divided into 2 teams of each for a game. At the end, very importantly, was the warm-down, to prevent any muscles from becoming stiff the following day. A: Tell us about the tournament in India. What were the other teams? How did Bangladesh fare? YR: The tournament, which took place in New Delhi, was the Middle Asia qualifying round for the Asian Basketball Championship, which will take place in China in September/October. It went on from the 9th of July till the 12th of July. However, the Bangladesh team went there about a week early, to acclimatize itself with the weather, food etc. and to get some valuable practice. The other 4 teams were India, Sri Lanka, Uzbekistan and Nepal. We ended up winning 2 matches and losing 2 and clinched the bronze medal. It was the first time in our history that we have been able to beat Sri Lanka. Uzbekistan got the gold while India was second. Sadly for us, only the top 2 teams qualified. A: What was it like to tour for our country? Tell us about your experience. YR: To be honest, it was a first hand unique experience. Not only did I get to know my team members over the tenure of the tour, I was able to interact with people of different countries. The reception in India was very hospitable and team bonding did eventually play its part. Apart from that, playing with people way taller (about 7 feet) than I, was, I must say, truly worth the while! A: By the way, is height a factor in the game? YR (laughs): To play a game, one must have physical advantages. In basketball, while height can be of an advantage (he himself stands a modest 6' 4"!!) it is not the only skill you must have. Speed, stamina, agility, reflex and excellent on-court vision are as important, if not more. As a matter of fact, our ball handler/ point guard Imran, stands about 5'7", and he was the surprise of the tournament, defeating players much taller than him in their own games. Come to think of it, many of the world's best basketball players are not unbelievably tall. A: So, how about support from the family? And any idols? YR: My family has always been supportive. As a matter of fact, my parents traveled all the way to New Delhi to see me play. Shaquille O'Neal and Hakeem Olajuwl are my idols. A: What are the plans for the future? YR; Right now, we will be preparing to host the South Asian Basketball Championship in December. Personally, I would like to continue to participate in as many tournaments as possible for my country, while keeping a balance between my work and the game. A: Any words of advice for upcoming basketball players? YR: Well, if you are interested, start off as early as possible, say in your early teens. Remain focused and dedicated. Also it is important to have a good coach/motivator who will keep you going. Oh… and lastly, do not get intimidated by any opponents just because they maybe taller or stronger than you! Anyone who follows the domestic cricket league of Dhaka would be aware that Gopibag is the side that the legendary "pop guru" Azam Khan plays for. APart from that, Gopibag is well-known for another thing: its terrorists. Gopibag is the prowling ground of many infamous lawbreakers and one of their crimes takes place in the headlines every now and then. So it when it comes to doing anything constructive and remarkable, people from Gopibag won't come to your mind. Yet that has been the case here for the last five years. 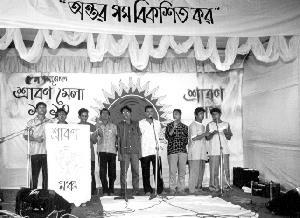 Since 1998, local youngsters have been organising a Sraabon Mela (Sraabon: the fourth month of the Bangla calendar, when the monsoon season is at its full blast) at Gopibag. The Mela (fair) includes stalls given by local people and also includes cultural programmes with recitations, songs etc. Some well-known writers are invited and they give speeches and discuss about our culture, our literature issues of our society and other things. The month of Sraabon is in the midst of this. Most of the poems recited and songs sung have Sraabon and the monsoon season as the central theme. A bulletin is also being published since the last fair in order to give the visitors an account of how the Mela has gone on. It also contains articles by the distinguished writers who are invited to the fair. As the organisers said, the main objective of organising this fair was to do something creative and productive and break out of the circle of crime and disorder in which they've been living for all these years. They wanted to prove that breaking the law and destroying the country are not all that people can do around here. People in the locality have always come forwrd o help them and contributed in whatever way possible so that they could arrange the fair nicely. Another objective is to give the children a chance to bloom as artists. Children don't often get a chance to perform in front of an audience. With a cultural programme being an integral part of the Sraabon Mela, the kids in the neighborhood get an opportunity of performing in public and this also helps them develop an interest in cultural activities. The fair is very small though, which the organisers said was due to lack of sponsors. In order to hold the fair on a much larger scale, they need financial support from big companies as the local people alone can't manage it all by themselves. Situations have improved a lot though. The first fair was held in a garage in the neighborhood and now it's become much bigger. The organisers plan to make it bigger and a lot more festive in coming years. If fortune favours them, they hope they'll evenbe able to spread the idea of celebrating Sraabon throughout the country. Finally, people celebrate other seasons like spring with proper gusto and colour but Borsha (the monsoon season) is never given such importance and affection. It was nice to see young people engaged in organising this fair though there have been many obstacles. Managing resources was a huge problem. Even nature was not cooperative since heavy rainfall poured in to spoil arrangements. But the spirit of the organisers never got defeated and they've unitedly achieved their goal. Hope the whole of Bangladesh becomes full of such aspiring and hard-working young people, instead of the corrupt and wicked people we see and hear of every day.